As part of slow parenting, we arrived at a decision to not buy many toys for our child. Now one might ask — but of course this is the age to play with toys. If not now then are they going to play with them during their 30s or what? Of course not! There is a subtle difference here — we only strive to not buy toys, but we don’t strive to stop the play. Here is why! When outings used to bother me! There was a point when I used to dread the thought of taking my child for an outing. But children need these little breaks from the usual routine. Firstly, I will be stuck with where to take my child. Malls are out of question. Being minimalists, we reduced a lot of shopping too. All our fruits, veggies and grocery mostly come from online stores as I order organic stuff and it is convenient. Well, the public gardens and parks looked like better options. The scene at most parks is the same — a roadside vendor with hundreds of plastic stuff for kids on his cart. They look so shiny and bright and inviting that it becomes difficult for the kids to turn a blind eye on them. And this is my other issue, that it becomes difficult to escape from my child’s demand to buy it all. Often people associate money to decide whether they should buy a certain product. While money is a basic necessity to buy things, it should not become the sole deciding factor when shopping. There are other important factors such as longevity, ways to recycle after use, safety, need, so on and so forth. On one such outing to lalbagh, my child started demanding me to buy each and every thing that we came across. After we are done with buying the juice, icecream, a potted strawberry plant, he was eyeing for some plastic masks. I said that they were not looking great and I promised him that I would make one for him after getting back home. All was well then and I almost forgot about the mask. Few days later, my darling reminded me of my word on making a mask for him and that day happened to be my most lazy day! Though I am a person who gets lost in DIY projects, I must admit that I have a starting problem, rather I procrastinate a lot! But what to do with my little boss giving me constant reminders for what I am due! Mommy and son on the floor with a white chart paper and we got into the job of painting it with a lot of yellow. 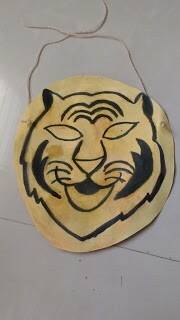 Then some black to get the features on the mask, two holes and two strings on the sides and voila, our mask was ready! Here is a picture for you. 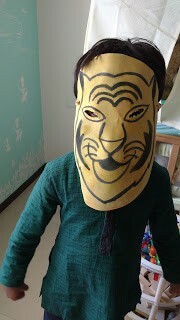 The boy asked for a tiger mask and he got one. And a good one hour of spending time together in making what he wanted, I could not be happier! What if I am not a good DIY parent? One of my friends once was telling me how she struggles to put her baby to sleep. I suggested her to try singing a lullaby that might calm the baby and aid in sleeping. She replied back saying, “oh, but I am not a good singer!”. If you feel the same way then here is some relief. When I showed the below painting to friends and family, many told me that my child has some good skills! 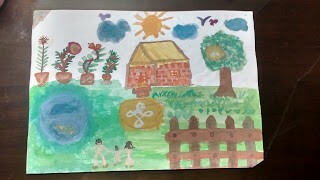 Let me tell you that this is not done by him but his mom :) His only request was to make a house, trees, birds, clouds, a fish in the pond (I challenge you to find it in the picture! ), a bird’s nest (I am sure this is hard to find too!) and we three walking up to our home. There you go, you know my skills in painting now! But who cares? This would still go on as long as the baby treats his mommy as a picasso! Have we considered the time it takes to DIY with both parents working in most homes? There are bills to pay, dreams to achieve, earn an identity, make a career, places to travel and parents strive to give a comfortable life to their kids. This kind of lifestyle often makes them wonder about the presence of time for DIY projects. However if you can make time for visiting malls on holidays, try using that time for DIYs on certain days. Also, let the time taking DIY projects be a weekend work at your convenience. While the elaborate ones can wait for weekends, you can start with simple DIY on a day-to-day basis too. Like singing a song while putting your kids to sleep, rather than playing an electronic record. Remember, we are not participating in a competition to measure the quality of our skills! No matter how it is, all kids want is being with them, they really do not care if it is up to the standards of Indian Idol! 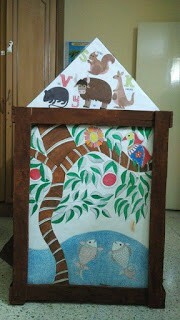 I know of parents who made a play house with the help of card board boxes and painted it with some madhubani art! Speak of DIY and sky is the limit to let your creativity go wild. Here is a photo of one of the playhome’s walls, posting below with permission. The story of our stuff! The other important concern when I see lot of plastic toys is their life and means of disposal — basically the life cycle of a toy. They are made in such a way that they cannot withstand the hardships of being in a child’s hand for a long time. With some kids, its life is over as soon as it enters home. There is no point in blaming the child as such toys are manufactured in a way so you can throw it and buy a new one in a wink. Now, more important is what happens next with the broken toy. Either it lies around, amounting to the scrap at home or finds its place in a dustbin. Do we realize the amount of carbon footprint that it takes to manufacture and recycle/dispose such goods? It is easy to say — come on, it costs just 100 bucks or for that matter, it’s easier to say — why should we look at everything through a zoomed lens? After all, it’s just a toy! What we do not realize is the kind of attitude that we are passing down to kids and the kind of environment we are passing on to future generations. If you want to understand more on what I am talking about, you should have a look at this video. I know I am no saint and had to give in to my kid’s demand of buying a feeble plastic toy at one of the melas that happen during festivals. All his cousins had one such toy in their hands and we were left with no choice but to buy one for him. I am sure all of us face such situations but we need to be conscious of not turning that into a habit. Reading this article gave me a feeling that I am not alone and life needs balance rather than perfection! The best alternative that I found to avoid buying such stuff is to Do It Yourself! I am sure the materials needed for kids projects are almost available at home. We usually need things like card board (save those cartons from your online shopping), news paper, glue, scissors, colours and paints etc. Even if you have to source some material, it is all going to be minimal and totally worth it. 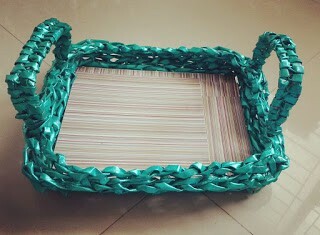 One such recent multipurpose basket (made with newspapers) that I made is shown below. Me and my child finished the painting part together. 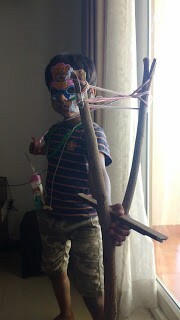 Once my child watched an episode of ‘Jai Hanuman’ at neighbour’s place and since then wanted to dress up like him along with a gada/mace (Hanuman’s weapon). What he asked me was, “can you make a gada for me?”. Guess DIY is a habit and I am glad he did not ask me to buy one. 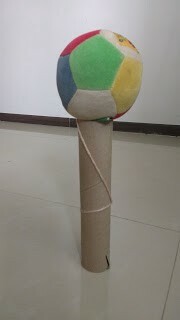 My husband made a gada for him in under a minute and here is the proof :) A soft ball tied to the tissue roll holder with a thread, as simple as it can get! So yes, anyone can do DIY if we put our heart into it! Another instance is when there is no need of any DIY. My kiddo picked up a lot of stuff about Shiva, owing to recent Shiv Ratri celebrations at his school. Also we have a Shiva temple in the neighbourhood with a huge statue of Shiva. When we were at a nearby park a week ago, he picked up some stick of a certain shape and started saying that it was his Trishul and he became Shiva! Truly, kids know how to be extremely creative when we stop supplying them with neatly finished goods all the time! Here is a picture of his Trishul, which later on became his bow (and arrow like in Angry birds) too — this is a multi purpose, eco-friendly, free of cost, amazing tool I tell you! When I told someone that we hardly buy toys, that person immediately said, but why do you want to make him a boring child and I almost laughed! He is the one who very well knows how to put his boredom to creative best, because he is used to finding beauty in ordinary things. We do buy toys like wooden blocks, like at his school, which can be used as a car, bike, mobile phone, ship, cot, table and what not? Just a few days ago we were traveling and had a long waiting time at the airport. While the adults were consumed in a conversation, the kiddo made rockets out of two hand baggage tags and was busy flying them. Ordinary things magically turn into something that he wishes and kids are usually at their best during pretend play. And when they are tired of pretend play, be ready to get your hands dirty on the floor with them. Well, I am talking about that ‘everything in between toys and play’ and that’s when we should DIY!